This document is targeted at networking and virtualization architects interested in deploying VMware NSX network virtualization in a multi-hypervisor environment based on the integrated solution from VMware and Juniper. VMware’s Software Defined Data Center (SDDC) vision leverages core data center virtualization technologies to transform data center economics and business agility through automation and non disruptive deployment that embraces and extends existing compute, network and storage infrastructure investments. NSX is the component providing the networking virtualization pillar of this vision. As a platform, NSX provides partners the capability of integrating their solution and build on the top of the existing functionalities. 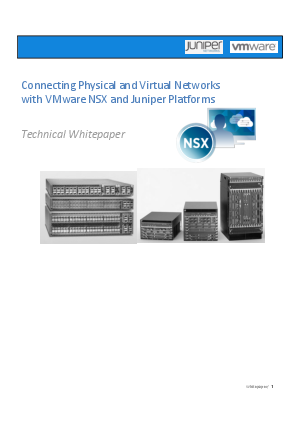 NSX enables an agile overlay infrastructure for public and private cloud environments leveraging Juniper’s robust and resilient underlay infrastructure that also helps bridge the physical and virtual worlds using the L2 gateway functionality.